Legendary Bollywood actor Dilip Kumar (93) has been conferred with the prestigious Padma Vibhushan, country’s second highest civilian award. The award was bestowed upon him by Union Home Minister Rajnath Singh. Maharashtra Governor Ch Vidyasagar Rao and Chief Minister Devendra Fadnavis were also present on the occasion. The Padma Vibhushan award for Mohammad Yusuf Khan aka Dilip Kumar was announced on the Republic Day of 2015 for his exceptional and distinguished service. 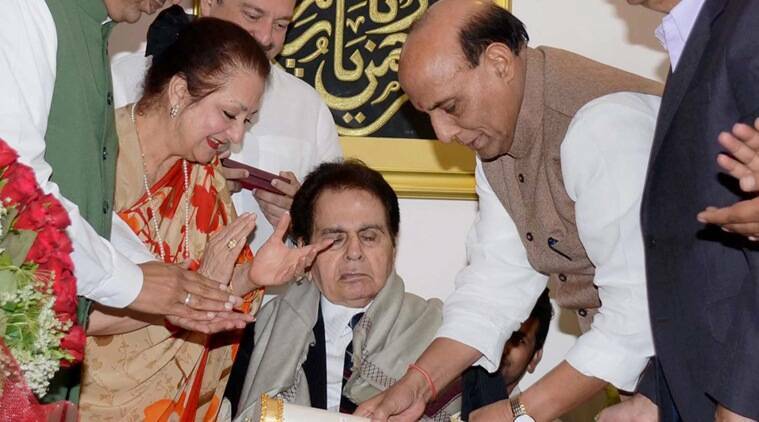 Dilip Kumar was to receive the Padma Vibhushan at a ceremonial function at the Rashtrapati Bhavan on April 8, 2015 in New Delhi, but he could not attend the ceremony due to his ill health. Dilip Kumar was born as Mohammad Yusuf Khan in a family of 12 children on 11 December 1922 at his house in the Qissa Khawani Bazaar area of Peshawar which is now known as Khyber Pakhtunkhwa, Pakistan. Dilip Kumar did schooling from prestigious Barnes School, Deolali, near Nasik. In the late 1930s, his family of 12 members relocated to Mumbai. Around 1940, while still in his teens he left home to start a canteen in Pune and managed to set up a sandwich stall at the army club and when the contract ended he headed home to Bombay having saved Rs. 5000. In 1942, he met actress Devika Rani, owner of Bombay Talkies, and signed up with the company on a pay of Rs. 1250 per year, here he helped out in the story-writing and scripting department because of his proficiency in Urdu language. On the request of Devika Rani, he changed his name from Yousuf to Dilip Kumar, and made his debut as an actor in the film “Jwar Bhata” in 1944 produced by Bombay Talkies.He is called as the ‘tragedy king of Bollywood’, and described as "ultimate method actor " by Oscar winning filmmaker Satyajit Ray. Famous Movies : In a career spanned over six decades, he starred in films of a variety of genres such as the romantic “Andaz” (1949), the swashbuckling Aan (1952), the dramatic “Devdas” (1955), the comical “Azaad” (1955), the historical “Mughal-e-Azam” (1960) and the social “Ganga Jamuna” (1961). He also done films like “Kranti” (1981), “Shakti” (1982), “Karma” (1986) and “Saudagar” (1991) and others. His last film was “Qila” (1998). Autobiography: "The Substance and the Shadow" written by author and former journalist Udaya Tara Nayar. Awards and Honours: He is a recipient of the coveted Padma Bhushan (1991), Dadasaheb Phalke Award(1994), Pakistan’s highest civilian award Nishan-e-Imtiaz (1998), he was also a former Rajya Sabha member. He holds a Guinness World Record for winning the maximum number of awards by an Indian actor.